Cat fanciers and coloring enthusiasts will be enchanted with this gallery of original designs. More than 30 full-page portraits of pretty pussycats form a rich tapestry of motifs that includes hearts, flowers, and paisleys in various patterns. Pages are perforated and printed on one side only for easy removal and display. 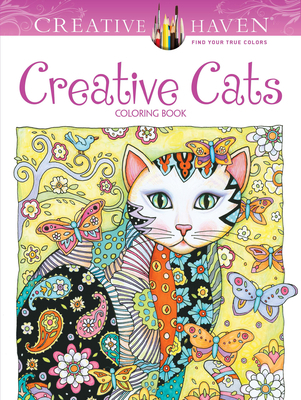 Specially designed for experienced colorists, Creative Cats and other Creative Haven(R) adult coloring books offer an escape to a world of inspiration and artistic fulfillment. Each title is also an effective and fun-filled way to relax and reduce stress. Marjorie Sarnat is the author and illustrator of Dover's bestselling Creative Cats Coloring Book and Owls Coloring Book as well as more than a dozen other books on art and creativity.The Chicago native is an award-winning mixed-media artist whose fanciful coloring book style evolved from her love of patterns, which she developed in the course of her work as a textile designer.